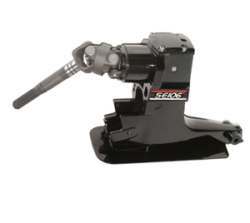 The SEI 106 Series sterndrives can be used to replace Mercruiser MC1, MR1 and Alpha Generation 1 sterndrives dating as far back as 1968. All of the Mercruiser Alpha Sterndrives utilize a 17 spline input shaft. The main thing to look for is if the sterndrive being replaced had both Trim and Tilt then the SEI 106 should retrofit for this application. If the sterndrive being replaced had Tilt only and was equipped with the old style shock absorbers, then the SEI sterndrive will not retrofit. Also to note is that the SEI sterndrives have a 13 spline shaft in the lower unit. Therefore if the lower unit of the sterndrive being replaced has a 13 spline shaft then the SEI sterndrive should retrofit without any trouble. The last thing to verify is whether you have the short or long input shaft. Select the following link (opens in a new window) to read more on how to determine this...Short Shaft versus Long Shaft. NOTE - You do not need to order a separate mounting kit to install these lower units.